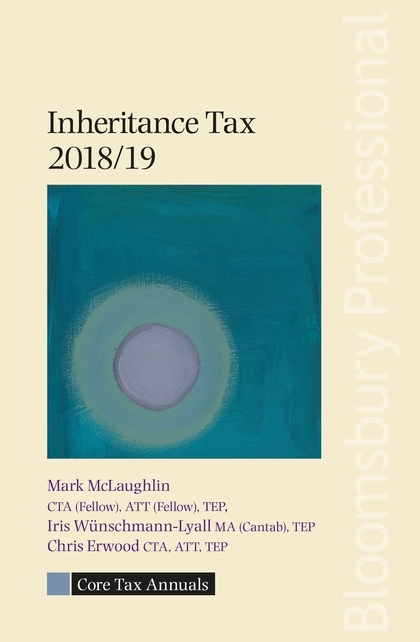 Inheritance Tax 2018/19 provides a clearly structured analysis of the major inheritance tax (IHT) provisions together with the tips and planning techniques needed to apply them successfully and to avoid potential pitfalls. This essential guide to inheritance tax helps you navigate progressively through the complexities of an increasingly difficult subject. It starts with the basic rules and principles before looking at topics in more depth. Whatever your level of expertise and experience, this book will be a valuable addition to your practice library. Domicile – New and updated commentary, including on the changes to the deemed domicile rules for IHT purposes from 6 April 2017. Non-UK domicile and excluded property – Updated guidance on the recently introduced changes to ensure that rights and interests in certain types of property are not excluded property to the extent that its value is attributable to a UK residential property interest. Case law – including Barclays Wealth Trustees (Jersey) Ltd and another v Revenue and Customs  EWCA Civ 1512 (excluded property), Routier and another v Revenue and Customs  EWCA Civ 1584 (charity exemption), Marr v Collie (Bahamas)  UKPC 17 (jointly held assets) and Palliser v Revenue and Customs  UKUT 71 (LC) (valuation). Family home and residence nil rate band – Additional commentary including on HMRC’s approach to the unwinding of home loan or double trust schemes, and the residence nil rate band and transferable allowance to spouses or civil partners. HMRC practice – Including points from HMRC’s Trusts and Estates newsletters.